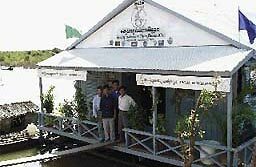 The GECKO is a floating environment center located in Siem Reap Province on the Tonle Sap lake, Cambodia. The GECKO resides within Chong Khneas commune a floating fishing village which moves locations with the seasonal rise and fall of the Great Tonle Sap lake. The GECKO center was established as part of the project "Participatory Natural Resource Management in the Tonle Sap Region". The Project is funded by the Belgian government and implemented through the Food and Agriculture Organisation of the United Nations (FAO). Visiting the GECKO when touring Angkor Wat and the Great lake is essential to learn more about Cambodia's rich cultural and natural resources. Learn about the Tonle Sap, the Mekong and the way fishing communities live on the lake. Come aboard this floating center to experience what it feels like to live on a floating house and speak with the environment staff who work in the center. Buy a locally made souvenir to help fund the environmental education programs. Any donations given in the GECKO are provided to the local community for development activities.